In addition to family and friends, holidays are all about food and gift giving. This year combining the two will not only be fun and cost saving, but could very easily turn into a holiday tradition. Homemade baked goods, or hand selected specialty food items, always make for truly appreciated holiday gifts. 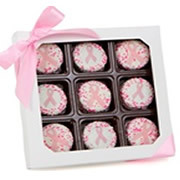 Easy to shop for and find food gifts online. Preparations can be fun and a welcomed tradition. The receiver enjoys the gift as it saves them time preparing food. Capitalizing upon one’s heritage is always a fruitful source of gift giving food ideas. Getting started after Thanksgiving is the best time to begin your culinary excursion. If you fancy yourself a baker, than enlisting the help of your children (or friends) for this endeavor is a good idea too. For example, if you grew up in a German family, making such items as Lebkuchen (German gingerbread) or Spekulatius (a spicy Christmas cookie) as presents, from recipes handed down through generations would be a easy gift giving notion. If you grew up in a Norwegian family, making such holiday food gifts as lefse (a tasty flatbread) or krum kake (a light, sweet, cone shaped cookie) will take time to prepare as well as specialty tools. However, finding such coveted recipes could require some phone calls and emails to family member; tipping them off to your impending gifts. In an effort to save time there are many websites that one could use in a pinch. There are many good websites (listed above) that are packed full with holiday recipes. Keep it simple: Make sure the food items are easily prepared. Enlist help from friends: Make a weekend of it with your friends and have fun. Make your lists early: In advance plan out what items you will make and for whom. Also create a master grocery list and make only one stop to the market. If you don’t fancy yourself as a baker, than purchasing food from a reputable establishment is a better idea for this year’s holiday gifts. There is such a wide variety of ideas to choose from, too, that it’s really up to you to decide not only what you’d like to give, but how much you’d care to spend. You can also decide to have one gift sent at Christmas time, or have monthly gifts shipped all year. 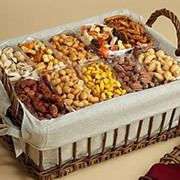 A wide variety of specialty stores offer food gift baskets with free shipping. Everything from sausages, cheesesand crackers, to cookies and coffee. Shipping a variety of different foods once a month, throughout the year, is a monthly reminder of how much you care for your family and friends. You can have steaks, fruits, and even wine shipped monthly. Most companies not only offer a volume discount, but also provide competitive shipping rates.